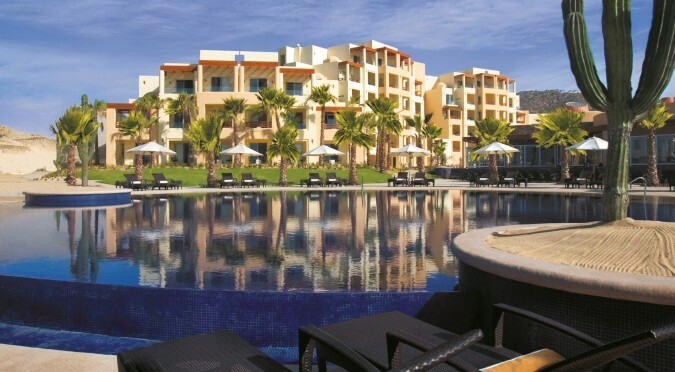 In the leading position is Pueblo Bonito Pacifica, which has been refined and expanded since its debut in 2005. Fronting a glorious 2.5-mile stretch of pristine beach and designed to showcase the unique beauty of the Baja Peninsula’s mountain-desert-ocean environment, this adults-only, all-inclusive hotel is located in the exclusive residential development Quivira, five minutes from the world-class Jack Nicklaus-designed course at Quivira Golf Club. Also voted to the list is Pueblo Bonito Los Cabos Beach Resort. Situated on popular Me?dano Beach in Cabo San Lucas—and with its updated suites and al fresco restaurants oriented to the dramatic rock formations at Land’s End—this lovely Spanish Colonial-style property was the company’s first venture in Los Cabos. The hotel, a perennial guest favorite, has taken the nickname “Blanco” for its pure white exterior. is 10 minutes from downtown Cabo San Lucas and features 749 junior and executive suites. The hotel boasts an array of restaurants, a spectacular Sky Pool set high above the sea, and is home to The Market at Quivira, a new “food hall” offering a range of eclectic eateries from Asian to Italian. Conde? Nast Traveler’s readers also acknowledged Pueblo Bonito Emerald Bay Resort & Spa in Mazatlan. Set above a beautiful crescent beach in a vibrant resort area on the sun-splashed Pacific coast, this all-suite resort sets the pace for excellence on Mexico’s mainland. Nestled on 20 acres, Emerald Bay offers lovely gardens, a top-class spa, and neoclassical architecture inspired by Old Mazatlan. Conde? Nast Traveler’s 2017 Readers’ Choice Awards are a major milestone for Pueblo Bonito Golf & Spa Resorts, which is currently celebrating its 30th anniversary as one of Mexico’s premier resort hotel and real estate firms. Starting with a single hotel in Mazatlan in 1987, the family-owned hospitality company has attracted a loyal following by consistently delivering great vacation experiences. More than 300,000 Conde? Nast Traveler readers submitted millions of ratings and tens of thousands of comments, sharing their recent travel experiences of the world’s cities, islands, hotels, resorts, cruise lines, airlines, and airports—good or bad. Winners will be celebrated in the November issue of Conde? Nast Traveler as well as online at www.cntraveler.com/rca. Pueblo Bonito Golf & Spa has eight award-winning resorts in two destinations, Cabo San Lucas and Mazatla?n, all offering luxury all-inclusive options. Each of the properties has its own personality, design and ambiance, yet all share the same high level of impeccable quality and distinguished atmosphere. In Cabo San Lucas, the adults-only Pueblo Bonito Pacifica Golf & Spa Resort is the ideal setting for a romantic getaway, while Pueblo Bonito Sunset Beach Golf & Spa Resort ,with its large, all ocean-view suites, is perfect for families. Pueblo Bonito Rose? Resort & Spa and Pueblo Bonito Los Cabos, both located on El Me?dano beach, have the best to offer vacationers looking to be right in the middle of all the Cabo action. In Mazatla?n, the elegant jewel Pueblo Bonito Emerald Bay Resort & Spa overlooks the Pacific Ocean and a private beach, while the charming Pueblo Bonito Mazatla?n, is located in the famous Golden Zone. Both resorts are great for family vacations and romantic getaways. For more information visit www.pueblobonito.com, find us on Facebook at www.facebook.com/pueblobonitoresort and follow us on Twitter @PuebloBonito. Need more information? Please contact one of our media representatives. Get up-to-the-minute fact sheets for Pacifica and The Towers at Pacifica here.